On Thursday, August 9, new champions in orienteering relay discipline will be found out after competition in the technically challenging Gauja valley forests. 29 women's and 38 men's teams are in the race for medals. The competition arena is located in the picturesque Turaida Museum Reserve. Ladies start at 14.20, men start at 16.20! Let's support our athletes! Spectators and participants can enter museum territory for free*! Which team will be the best at solving the puzzle of Gauja National Park forests - unaffected by human hand, almost impassable at some places. The steep slopes and deep ravines of the Gauja valley with the maximum height difference of 95 meters will only add to the challenge! *Only for the territory. In order to look inside the museums buildings and exhibitions you will need a ticket. WOC2018 Middle course in Laurenči, Sigulda came up with surprises. The thrill was present to the very last moment and –as a result mai favourites didn’t get thegold they were craving for. There were 71 ladies on the start lane for 4.8 kilometres long course with 17controls. Hardly anyone believed that Tove Alexandersson, current World Cup leader could miss her “hat trick” getting the gold for the third year in a row. However, the beginning of the course turned into a disaster. Starting from the last position, Tove didn’ t manage to complete the course. She withdraw turning her arrived to the finish without the result but with a smile on her face – Velnala (Devil’s Cave) had used its evil charms against Tove and one of the cotrols took her about 15 minutes. As a result, Russian Natalia Gemperle got her first ever Middle distance gold – she was the bronze medallist back in 2016. It took a minute and a half longer to reach the finish for Finland’s Marika Teini, the current champion of Europe. It was Marika’s first World championships medal in her career. Frenchwoman Isia Basset won bronze, finishing 5 seconds ahead of Sabine Hauswirth from Switzerland. Unfortunately, some competitors had to seek for medical aid because of wasp attacks on the very start of the course. Natalia Gemperle, Russia and Eskil Kinneberg, Norway won the Middle Distance at Nokian Tyres World Orienteering Championships in Latvia. Russian Natalia Gemperle took her first individual gold at WOC after a very strong finish in the Middle Distance. The medallists Gemperle, Finnish Marika Teini and French Isia Basset were all fighting for the gold medal. The decisive moment came on the last part of the course where Gemperle ran with a higher speed than the other two. Marika Teini took the silver, her first individual WOC medal, 1.30 after Gemperle. Isia Basset took her first championships medal ever, 1.54 after Gemperle. Her bronze is also the first French WOC medal on the women’s side in history. The men’s race was exciting to the very end and it was only 43 second between the winner and sixth place. Almost all runners made mistakes during their races. Norwegian Eskil Kinneberg made a very strong finish and won with a six seconds margin to Daniel Hubmann, Switzerland. It was Kinneberg’s first individual WOC medal. Swiss Florian Howald was third, only 14 seconds after Kinneberg. Another Swiss runner, Matthias Kyburz was fourth just nine seconds from bronze medal position. The green Latvian forest was a challenge and many of the favourite names made big mistakes both in the women’s and in the men’s race. Tomorrow is rest day and WOC continues with Relay on Thursday. Free start from 14:00 till 16:00. No SIAC in use, organaizers will give punching SIcards. There will be three corses - short (3.1km), medium (5.2km) and long (7.1km). There will be refreshments after finish. Swedish triumph at Sprint Relay! Maja Alm’s superpower brings bronze to Denmark! Āgenskalns neighbourhood of Rīga hosted Mixed Sprint Relay race of WOC 2018. This particularly romantic part of Rīga granted its benevolence to the favourites. For the second time in a row Swedish quartet was unbeatable Swiss team finished in strong silver position while Denmark reached for bronze out of almost hopeless seventh position. 33 countries had entered the competition. The silver medallist of sprint ToveAlexandersson took it seriously on the first leg. The leading position was maintained by Emil Svensk and secured by Jonas Leandersson and Karolin Ohlsson. The other two steps of the podium became a subject of exciting battles during each of the legs. Before the decisive leg Czech Republic and Norway shared the silver position. However, none of them reached the podium. The sprint queen Maja Alm who became the World Sprint Champion here in Riga just a day before came onto the stage and bronze award goes to Denmark. The bronze girl Judith Wyder managed to bring home silver for Switzerland, starting her run in fourth position. These strong performances shifted Norway and Czech Republic down to respectively fourth and fifth places. The sixth bouquet of flowers went to Russian team. Today is rest day at Nokian Tyres World Orienteering Championships. Are you interested in orienteering and IT? Attend the open IT meeting in Sigulda tonight! The two hours meeting will be held at Hotel Sigulda and it will start 18:00, Monday 6th August. Who won and who lost a medal? The WOC 2018 sprint final turned out very exciting. The events changed in the distance every second. A great match analysis here. By Jan Kocbach, worldofo.com. Danish Maja Alm writes a new line in the history of orienteering! She wins the fourth consecutive gold! The Sprint Finals offered all kinds of obstacles – sudden showers, accompanie d by thunder, speed reducing crowds of tourists, slippery cobblestone, narrow passages and yards that made routechoices tricky – only those who managed to cope with this bunch of challenge could aim for medals. The rivals were worth each other – as the Men’s class winner only won by a second while Maja Alm confirmed her Sprint Queen title for the fourth time. It was the first time ever that Sprint Finals took place in the very centre of the capital city. Both organizers and runners faced new challenges fighting their way through slow Saturday afternoon sightseeing lovers from all around the world, simultaneously trying to solve puzzles offered by the course planner. Maja Alm won her fourth sprint gold in a row and Daniel Hubmann his second at Nokian Tyres World Orienteering Championships in Latvia. The reigning World Champion Maja Alm, Denmark, managed to win the Sprint in central Riga today. She had a bad start and made a mistake already on her way to the first control. - It didn’t look as I expected, and I got a bit stressed, says Maja Alm. She was 10 seconds behind after 1,2 kilometres of running, but after a really strong finish, she won with 16 seconds to spare ahead of Tove Alexandersson, Sweden. Judith Wyder, Switzerland was third, 27 seconds after Maja Alm. Switzerland’s Daniel Hubmann won the tight men’s race, only one second ahead of Tim Robertson, New Zeeland. Switzerland were also in third place, with Andreas Kyburz, 20 seconds behind. Both Robertson and Kyburz took their first World Orienteering Championships medal in today’s Sprint. Hubmann took his 25th WOC medal and 8th gold in rainy Riga. He finished early and had to wait for the others to finish, following the split times closely. - Of course I was nervous, and I knew it could be a medal or not, says Daniel Hubmann. In Sprint, only seconds can stand between you and the podium. He managed to win a gold, his second WOC Sprint gold in a row. The World Orienteering Championships continue with Sprint Relay tomorrow. World Orienteering Championships sprint qualificatiom heats at Kronvalda parks are over and both fastest 45 men and women are ready for their final battle for medals that is going to take place in Old Riga at 3 p.m. There were 91 ladies that fought in 3 qualification heats. 15 best from each heat made it to the finals. It is obvious that all the favourites are clearly in. Three times world champion Maja Alm won heat C, she managed to run 3.4 km in 12:12, winning 10 seconds to Anastasia Denisova from Belarus, who was in the fifth position last year. The main Maja`s rival and this year`s World Cup leader Tove Alexandersson, finished in fifth positiom, losing 43 secomds to Maja. Also Amastasia Rudnaya from Russia and Swiss Elena Roos (sixth position in sprint 2017 and silver medalist at WOC2018 selection races in Limbazi) were faster than Tove. World championships in orienteering WOC2018 will kick off with the sprint qualification. Sprint competition will take place in one of the green ornament of Riga city – Kronvalda park. Kronvalda park is a part of greenery of channel side of Riga old city and comprises the territory of 11,92 ha, divided in two parts by city and where you can find around 104 foreign tree and bush species. Park was created in 1883, when Riga city garden master Georg Kufalt elaborated the plan for territory improvement and started to lay out greenery. In honour of author of Latvian nation awakening idea in 19th century Atis Kronvalds, the park was named Kronvalda park in 1935. Qualification competition first will start ladies, and first start is at 9:01. For qualification competition has applied more than 97 competitors. Among them the main favourites – queen of the last three years sprint Maja Alm from Denmark and the current leader of World rankings and very strong Swedish Tove Alexandersson. We remind, that Alma, three times World sprint champion and two times gold medalist in Sprint relay, did not compete in WOC2018 selection competitions in Limbazi and Ligatne due to the health problems, meanwhile Alexsandersson (European sprint champion in 2018 and silver medalist in World sprint championships in 2014) won both – the sprint and the long distance. Among other medal contender we should mention sprint silver medalist of 20176 Natalia Gemperle from Russia, World sprint champion from 2014 and European silver medalist this year Judith Wyder from Switzerland, 6th place winner in last years WOC in sprint and 2nd place winner at selection race in Limbazi – Swiss Elena Roos. Some athletes can surprise with podium place as Russian Galina Vinogradova (3d place at WOC 2017), Belarussian Anastasija Denisova (3rd place at WOC 2016 and 5th place at WOC5 2017). From Latvian team in sprint qualification will run Sandra Grosberga, Liga Valdmane and Irita Pukite. For our athletes to get among top6 is quite unreal, but if Sandra Grosberga will make top10, that would be outstanding result, but more likely she could improve her best result so far in sprint, which is 20th place, achieved last year at WOC in Estonia. Men will start at 10:01, and in qualification will compete 116 athletes. Main favourites are Swiss – super universal, WOC champion in sprint in 2017 and 2011 Daniel Hubmann and WOC champion from 2012 Matthias Kyburz. Both with identical result became European champions this year, but in WOC2018 selection race in Limbazi Kyburz won, beating Hubmann by just 1.5 seconds. Other medal contenders are World champion in sprint from 2015 Jonas Leandersson from Sweden, silver medalist from 2017 Frederic Tranchand from France. Among those, who can surprise, we can mention Yannick Michels from Belgium (5th place at WOC2015), Vojtech Kral (6th place in 2017), brit Christian Jones (4th place in 2016), New Zealander Tim Robertson (4th place in selection race in Limbazi). From Latvian athletes in sprint will compete Andris Jubelis, Arturs Paulins and Rudolfs Zernis. If somebody from them will get among top10, that would be great result. A press conference devoted to opening of World Orienteering Championships was held on August 3 at the Riga City Council. It was attended by Tom Hollowell, Secretary General of the International Orienteering Federation, Juris Radzevičš, Executive Director of the Riga City Council, Jānis Lazdāns, WOC 2018 Director, Daniels Kārkliņš WOC 2018 Technical director, WOC 2018, Jānis Rukšāns, representative of the World Trail Orienteering Championship and Latvian team leader Jurģis Krastiņš. Riga City Council Executive Director Juris Radzevičs: "We are very pleased that the World Orienteerin g championship takes place in Riga. And it is a great pleasure that Riga is first city where the championship race is held in the historic center of the capital, in the very heart of the old city. This beneficial both for orienteering sport and the city of Riga as it will help to promote the popularity of orienteering sport. This is a special year for us - we celebrate Latvia's 100th anniversary. When Latvian orienteering sports people first spoke about the idea of organizing a world championship in Riga ten years ago it seemed to me a completely crazy and completely impossible idea. But that's what happened! I wish all a successful championship, good luck for athletes and a fair competition!" "I am delighted that WOC and WTOC are being organized for the first time in Latvia. In particular, it is pleasant that the championship will enrich the range of events in the year of the celebration of Latvia's centennial. The World Orienteering Championship has several goals. The first, of course, is to find out and award of the world's best orienteers. This is an opportunity for athletes to demonstrate their performance both in the urban environment and in the forest. This is also a unique way for the world to show the country - the city's environment, unique tourist sightseeing objects. Secondly, world championships is a way increase the visibility of the sport. We will broadcast live all competitions on several national TV channels, and of course the highlights will spread even more. Thirdly, organizing such large events helps to increase the popularity of orienteering as a sport. Let's see if we can make the orienteering even more popular in Latvia." WOC 2018 Director Janis Lazdans: "We are ready! We worked hard to plan interesting courses. In order to avoid the tourists and residents of Old Riga being surprised unprepared by the high-speed athletes during the competition, we have proposed the idea of attaching a small bell to athletes leg. Competitions will be very interesting and exciting. I invite fans and spectators to come to the racing arenas, where they can fully experience the atmosphere of the race, follow main events during the courses. However those who will not be able to watch the competition at the venue will be able to follow it live on TV and online. Many thanks to the Riga City Council, Sigulda and Krimulda counties, as well as to the Ministry of Education and Science for support in organizing the championship in Latvia. WOC 2018 Technical Director Daniels Kārkliņš: "We have paid a lot of attention to the way the world will see this championship. We have su rveyed all districts and competition areas and chosen the best places to let competitors and spectators see the beauty of Latvia. Sprint and sprint relays will indeed be very interesting - the distance in Old Riga will be worth it. And to make it even more difficult for athletes, we will place artificial obstacles in the distance. On the other hand, the competition area in Āgenskalns will feature a completely different environment - with parks and the architecture and street planning of a historic 19th-century worker's district. This opportunity has been a big challenge for the Latvian Orienteering Federation, we are ready for it. Technically we have solved the most complex tasks. For example, to provide live TV, the length of the optical cables put out in the forest courses in Turaida is more than 12 kilometers!" WTOC 2018 representative Janis Rukšāns: "150 participants from 24 countries will take part in the trail orienteering champi onship. Mostly from Europe, but also from the United States, Japan, and I just saw that Hong Kong athletes have arrived!" Latvian team leader Jurģis Krastiņš: "For any athlete, no matter what kind of sport he is in, to start in the world championship at home is something special. And of course, Latvian athletes will benefit from the fact that they know the race areas. Most of them have started their orienteering career in similar areas and are accustomed to their specifics. The feeling of home is important for everyone. And starting in your home country allows for example bring along cucumbers and tomatoes grown up in your own or parents gardens." The World Orienteering Championship is highly popular among viewers. And not only in the competition arenas but also on TV screens since high-quality live broadcasts are provided from the venues. The largest orienteering event of the year of Latvias' centenary will be also broadcasted on TV channels and online. A filming team from the Czech Republic will provide live TV broadcast. This team has great experience in filming orienteering competitions, and it also provides live coverage of the Biathlon World Cups. The WOC 2018 organizers, together with the TV team, have already chosen the best shooting spots to show spectators around the world the strongest and best athletes and also unique cultural objects and spectacular areas in Latvia. The competition will captured by 10 TV cameras that will be located both in the start and finish zone and in multiple spots in the course. In order to provide a great live coverage, up to 12 km of optical cables will be rolled out in competition areas. Live broadcasts will include highlights explained by professional commentators, LIVE results and GPS tracking so viewers will be able to follow each competitor's route choices. WOC 2018 will be broadcast on nine national televisions. It is estimated that live shows will be watched by hundreds of thousands orienteering fans. Live orienteering provides a paid service. The entire package (live broadcast of all competitions with comments in English and in parallel with Russian) costs 20 euros. 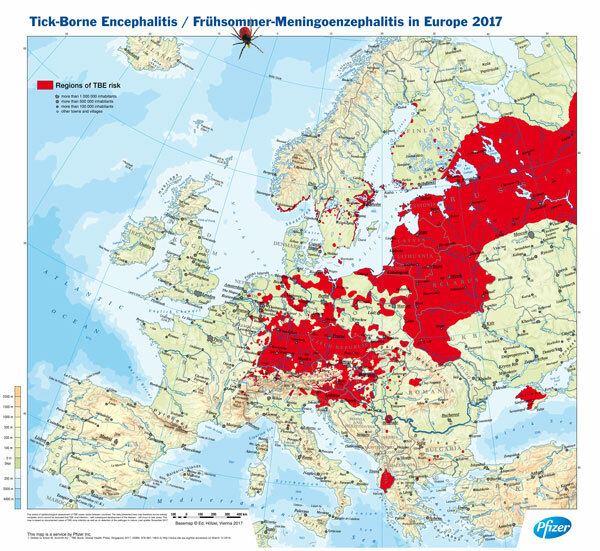 IOF and WOC 2018 organiser team up with Pfizer to inform about Tick-Borne Encephalitis TBE. 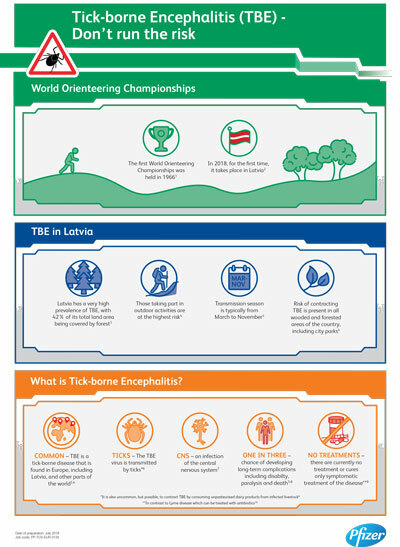 The IOF is proud to announce a partnership with Pfizer and the WOC 2018 organisers to provide information about TBE, a disease which is very relevant to talk about in the orienteering community. In connection with WOC 2018, more specifically in connection with the WOC Middle distance competition on Tuesday August 7th and the Latvian O-Days competition on Wednesday August 8th, , personnel from Pfizer will be present in the arena with information about TBE and what you can do to protect against the disease. In addition on Wednesday August 8th a mobile vaccination unit will be present to offer vaccinations against TBE. – We are very pleased to be able to announce this cooperation with Pfizer targeted at addressing a medical issue which may affect so many in the orienteering community globally’, comments IOF CEO Tom Hollowell. – We hope that as many as possible will take the opportunity to learn about TBE and disease prevention during WOC 2018. This is a highly relevant discussion to have when we are here in Latvia. The cooperation between the IOF and Pfizer stretches beyond just WOC 2018 and more information will be available via the IOF website and other IOF events in the near future. TBE is a tick-borne disease that is found in Europe and other parts of the world. Latvia has a very high prevalence of TBE, with 42% of its total land area being covered by forest. Risk of contracting TBE is present in all wooded and forested areas of the country, including city parks. Transmission season is typically from March to November. Those taking part in outdoor activities are at the highest risk. The TBE virus is transmitted by ticks. It is an infection of the central nervous system. There is a chance of developing long-term complications including disability, paralysis and death. There are currently no treatment or cures only symptomatic treatment of the disease. Lets cheer for our athletes at WOC 2018! Let all orienteers feel our support! We encourage all spectators to cheer for our athletes and to take national flags and atheltes banners and flags with you. We will provide a dedicated place in each arena to mount fan club banners and flags during the races. There will also be a special fan area devoted to the closest and most passionate fans of World Orienteering Championship participants. Athletes this is your chance: get your friends and families closer so you can share your emotions with them right after the race! Each athlete can claim their access cards to the fan area during the registration at the Event Centre or Event Office. Number of access cards is limited. The registration of participants for the 35th World Championship in orienteering has ended. With 49 participating countries from Eurasia, Africa, North America, South America and Australia five continents will be represented in the competition taking place in Riga and Sigulda from August 4-12. All together 345 athletes - 192 men and 153 women - will start at the World Championship, they will be accompanied 81 by team officials. Among the participants of World Championship are orienteers from Australia (11 athletes), Brazil (4), Canada (4), China (8), Hong Kong (8), South Korea or the Republic of Korea (8), Japan (10), New Zealand (9 ) and USA (10). Furthermore, South Africa has delegated two sportsmen, Egypt and Colombia - each three athletes, Democratic People's Republic of Korea (North Korea), Argentina, Macedonia, the Netherlands, Serbia and Slovenia are going to be represented by one athlete each. Biggest teams for WOC 2018 have been submitted by Finland, the United Kingdom and Norway - all represented by 14 athletes. Sweden, the country with most medals in orienteering championships so far, will take part at this years competition with 13 orienteers. The same number of athletes will represent Switzerland which holds the third position as for orienteering championships medals won by now. Russia has announced 12 athletes for its WOC 2018 team. Team Latvia will start with 9 orienteers - four men and five women. We remind that the world championship in orienteering was first held in the Baltics last year in Estonia, when 366 participants (204 men and 162 women) from 50 countries participated in the WOC 2017. During the 35th World Orienteering Championship, 10 medal sets will be awarded in 5 disciplines. The medals are already minted and waiting for their future owners! So far, Sweden has won the most – 153–medals, including 49 gold, 52 silver and 52 bronze medals. Norway has won 130 medals (43 gold, 45 silver and 42 bronze) in the world orienteering championships, and Switzerland 102 (42, 29, 31). Altogether 17 countries are among the world championship medal owners, including Latvia, which boasts three medals - one golden and two bronze medals (all won by Edgars Bertuks, who was also included in the Latvian team for this years’World Championship). Individually the richest medallist for men so far has been the French orienteer Thierry Gueorgiou, who won 23 medals in the world championships, including 14 gold medals, eight of them in the middle distance. Thierry Gueorgiou is one of the few orienteers who won the World Champion title in all major disciplines - sprint (once), middle, long (four times) and relay (once). With his last gold medal last year in Estonia, Gueorgiou made a point to his outstanding career and is currently a Swedish team trainer. The second most awardedorienteer is the current world champion from Norway Olav Lundanes. He has 14 medals together, including seven gold (four times the champion in the long distance), and maybe he will add to his medal collection in Latvia. The third richest medalist is the orienteering star of the first half of the 80's, Norwegian Øyvin Thon. He has seven gold medals (five times champion in a relay, 2 gold medals in the long distance). Simone Niggli from Switzerland has won the most medals in the women's competition, becoming the all-time most awarded athlete in orienteering. She owns 31 medals in total, including 23 gold! Simone Niggli is the only one who won gold medals in all four disciplines in the two world championships (at that time there was no mixed sprint relay discipline), is eight-time champion in the long distance, 7 gold medals in the sprint, owns 5 gold medals in the middle, 3 in the relay. The end to career was made in an excellent style - with gold medals in all three individual distances in 2013. The second most awarded female orienteer is Minna Kauppifrom Finland - 9 gold medals (five-time champion in relay, three gold medals in the middle distance and one in long distance) and a total of 17 medals. She won herlast gold medal five years ago. Two Swedish orienteers that have also finished their careers Marita Skogum and AnnichenKringstad both have won six gold medals. But there are two orienteering superstars who can still add to their world championship medal list. One of them is sprint specialist Maja Alm from Denmark who can boast of 13 medals, six of which are gold medals. And the other, the current world leader, 25-year-old ToveAlexandersson from Sweden has already won 14 medals, five of which are gold. Perhaps it will be her to triumph at this years’ long and middle distance. From August 3 to 12, Latvia will become the centre of orienteering as it will host the 35th World Championship, during which more than 300 strongest athletes from 50 countries will compete for 10 medal sets in 5 disciplines. At the press conference dedicated to theforthcoming race, the Latvian team named its goal - to win a medal in the orienteering relay for the first time in history. "Latvia was fighting for the right to host the world championship for four years, however each time the International Federation of Orienteering gave preference to one of the big orienteering countries. Eventually the small countries got their chance to prove that they are able to organize the most important orienteering competitions in sport - last year the championship was held in Estonia, but this year in Latvia, "said Janis Lazdans, the deputy chairman of the Latvian Orienteering Federation (LOF) and the director of the World Championship WOC2018. The World Championship in orienteering is an exciting event for the spectators, so we encourage all interested sport fans to come to competition centres and enjoy the world championship atmosphere and cheer for the athletes. The competition centres will be arranged so that spectatorscan see it all - the start, the finish and most exciting events during the distance, furthermore using modern technology spectators will be able to keep track of the athletes’ course in the woods. In addition, sport goods shops and cafes will be available in competition centres.Visiting the competition is free! (With the exception of entrance fee at the Turaida Museum Reserve to attend the race arena of the relay and of the long distance)! "Special attention will be paid to live TV broadcasts, available both on television and mobile devices, as live broadcasting on Latvian channels will be provided by LMT Straume. Shooting at racing arenas and distances will be carried out by ashooting team from the Czech Republic, which has a vast experience in filming orienteering races, the same team also provides live TV coverage at the biathlon World Cup. TV broadcasts will be shown on 9 national TVs, and audience coverage is expected to be hundreds of thousands, "said DanielsKarklins, WOC2018 technical director. Latvian orienteers will also go on to fight for medals. This year 9 sportsmen will represent Latvia at the World Championship: Sandra Grosberga, Inga Dambe, LigaValdmane, IritaPukite, Laura Vike, Edgars Bertuks, AndrisJubelis, ArtursPaulins and RudolfsZernis. Sandra Grosberga, LigaValdmane, IritaPukite, AndrisJubelis, ArtursPaulins, RudolfsZernis will run the sprint race. At the mixed sprint relayLatvia will be represented by Sandra Grosberga, Inga Dambe, AndrisJubelis and ArtursPaulins.Middle distance will be run by Sandra Grosberga, Inga Dambe, Laura Vike, Edgars Bertuks, ArtursPaulins andRudolfsZernis. Forest relay team for men will be Edgars Bertuks,AndrisJubelis, ArtursPaulins andRūdolfsZērnis, for womenSandra Grosberga, Inga Dambe and Laura Vike. Sandra Grosberga, Inga Dambe, Laura Vike, Edgars Bertuks, AndrisJubelis and ArtursPaulins will race at the long distance. "The competition at World Championship will be impressive. The planets’ most powerful orienteers will fight for medals in Latvia. To race at our own home for the first time in history is a celebration itself, however the goal of Latvian team is not only to participate. The team set its goal four years ago, when we learned that Latvia got the right to organize the championship. And our goal is - we want to win medals in the relay! Of course, each athlete also has his own personal goals, and they are - to fight for the top ten positions at individual distances," said JurgisKrastins, head of the Latvian orienteering national team," adding: "For Latvian spectators, this will be a unique opportunity to experience the highest level competition right here, at home, on the spot. It will be a chance to meet the world's best athletes in one of the most popular endurance sports in the world." Latvian team also includes the experienced orienteer Edgars Bertuks, who has won the first world championtitle in the history of orienteering in Latvia and the whole Baltics. In 2012, he became the champion in the middle distance and won the bronze medal in the long distance, but in 2013 he was took home the bronze medal of long distance. "I am very honoured to be part of the team. At times various injuries made me doubt whether I will be able to represent Latvia at this years’ Championship, or not. It seemed to me that it was not meant to be, but here I am! The fact that the world championship takes place at home is a very special occasion. This is a dream that has finally come true. I will certainly remember it as one of the most striking events in my athlete's career. Spectators come and support us!" invited Edgars Bertuks. Part of team Latvia - from the left - Artūrs Pauliņš, Laura Vīķe, Sandra Grosberga, Edgars Bertuks and head of team Latvia - Jurģis Krastiņš. Medals are ready for WOC2018. Registration for Latvia O-Week has been extended up to 16th July 11:59pm. Don’t miss the chance to gain new experience in Latvia!!! First days of selection races - sprint and middle distances. Friday started with selection race in sprint distance were runners fighted for places in national teams. Distance took place in Limbaži - an old town built in 13th century. There were runners from 24 countries and the best results had Matthias Kyburz ️ and Tove Alexandersson . From Latvian team best runners were Sandra Grosberga and Rūdolfs Zērnis. Best runners from Latvia team were Sandra Grosberga and Rūdolfs Zērnis. Bulletin no. 2 for Selection Races has been published. You can find it here (.pdf). All information about Selection Races (start lists, live results) will be published in section "SELECTION RACES" of our web-page. A little more than two months remain till the launch of the 35th World Orienteering Championships 2018, to be held in Latvia from 4 August to 12 August. So far we already know the first 24 countries who have officially registered altogether 189 athletes representing their national teams. It is expected that about 50 national teams will compete in the World Championships. Orienteering “great power” Sweden who reaped 7 medals (including 4 gold) in the last year’s championships in Estonia, France (3 medals), Switzerland (also 3 medals), Finland (2 medals) are among the teams who have already made their official entries. This year in Latvia Sweden is going to participate with 13 athletes, France with 11 athletes, Switzerland with 12 athletes, while Finland up to now has registered the largest number of athletes, as many as 18. Other countries who have registered their national teams for the WOC2018 are Australia (10), Brazil (4), Canada (4), China (8), Japan (10), Republic of Korea (8) and even New Zealand (9), while only one athlete will represent the Netherlands. We kindly invite all lovers of orienteering sports to enter the WOC2018 spectator race “LATVIA O-Week”, to be held parallel to the world championships, and feel the atmosphere of the world level competition while running in the same terrains where the WOC2018 runners compete. As part of “LATVIA O-Week”, anyone will be able to take part in the sprint race in the very heart of the capital city Riga on 4 August: the spectator race will start immediately after the WOC2018 Sprint Qualification in the same area. In the afternoon the spectators will be able to follow the WOC2018 Sprint Finals and the World Orienteering Championships Opening Ceremony. Other “LATVIA O-Week” races are scheduled: on 7 August – forest sprint in the Latvian Ethnographic Open Air Museum; on 8 August in Sigulda and 10 August in Mazie Kangari the runners will be able to test their orienteering skills in middle distance; on 5 August in Carnikava and 12 August in Turaida there will be a chance to challenge one’s stamina in long distance. Register for “LATVIA O-Week” now! Having entered for all 6 days, the competitor is eligible to a 15% fee discount. Upon registration it is possible to order the official WOC2018 fan T-shirt or “forest” running shirt; the price is EUR 25. The athletes participating in the 35th World Orienteering Championships will compete for 10 sets of medals in 5 disciplines. Thrilling urban sprint races will be held in Vecrīga and Āgenskalns, whereas forest races will take place in the vicinity of Sigulda. The arenas will be set up in a way that makes following the race interesting for fans and TV spectators. The Event Centre in Sigulda will be located in the new cross-country skiing facility in Laurenči, while in Turaida it will be situated in the Folk Song Garden. This year in Sigulda will be full of different events! During WOC2018 week two big music concerts will take place at Sigulda Castle ruins. On 3rd of August you have a chance to see American blues rock group "Dire Straits", but on 4th of August Rita Ora will perform all of her international hits. One of ALL4o.com’s primary goals is to spread the sport of orienteering worldwide and promote its development as global sport, one day to be included in Olympic Games. Additionally, we want to raise the awareness and accessibility of orienteering sports worldwide.Therefore, “ALL4o.com – All For Orienteering”and “World Orienteering Championships 2018” event orginizers have signed an agreement of partnership, and we believe by participating in “LATVIA O-WEEK 2018” and WOC2018 events, you will have exciting summer adventure and grow in the experience. Please find information about Training possibilities here. Bulletin 1 for WOC2018 Selection Races - here. Join the WOC2018 organizers team! 2018 will be an active year for the Latvian orienteering community, as we will be hosting the World Orienteering Championship where the best athletes from all planet will compete for medals in five orienteering disciplines. To have everything running smoothly, we cannot do without our eager-to-help volunteers. Therefore, we invite you to join the organizers team. There will be a lot of work and everyone will have an appropriate job to do according to one’s area of interest. You must be at least 15 years of age to apply as a volunter. We expect that you help us at least 3 days, 8 hours per day. For volunteers, we offer accommodation in Sigulda in a school on the floor with your sleeping accessories, catering and transport to the arenas on all days when you work, clothing (a t-shirt, vest and cap). Moreover, you will have an opportunity to go orienteering two days as part of Latvia O-week free of charge. If you are ready to help, please fill out this form and we will contact you. According to the Office of Citizenship and Migration Affairs, Sigulda municipality has 18,677 inhabitants, currently accounting for about 1% of the total population in the country. With a total of 10 Olympic Winter Games medals won during the last three Winter Olympic Games, which is one medal per 1867 inhabitants, it thereby takes first place in the world. The Norwegian region of Trondelag, which has 400,000 inhabitants, about 8% of the total population in the country, is second with 30 Olympic Winter Sport medals, thus earning one medal per 13,333 people. On a national basis, the top ranking is Finland with one medal per 17,904 people, Sweden with 19,649 people per medal, and Hungary with a medal for each 20,792 inhabitants. Starting with the 1992 Olympics in Albertville, France, Sigulda has taken part in all the subsequent Winter Olympics, and in the last two games local athletes Martins and Tomass Dukurs, Andris and Juris Šics, as well as Janis Strenga have won two gold, three silver and five bronze medals. „10 Olympic medals, five citizens of Sigulda, on per cent of the population of Latvia. These statistics cannot be called a mere luck or coincidence," says Uģis Mitrevics, the chairman of the Sigulda Local Government Council. This is a convincing evidence of our dedication, enthusiasm and power. Our motivation to proceed with all we have started is only getting stronger: to provide our athletes with a modern infrastructure, education and support in organising trainings and international level competitions. We want to educate the would-be world rank athletes and participants of the Olympic Games. We want the name of Latvia and Sigulda to be pronounced in the world over and over again. We are the capital city of Latvia in winter sports despite the fact that we make only one per cent of the Latvian population: this is the richest in medals and the most exciting one per cent,” Uģis Mitrevics, the chairman of the Sigulda Local Government Council, speaks with pride. The achievements of the athletes coming from Sigulda, apart from each year attracting the world’s attention via live Eurosport TV broadcasts from Sigulda to millions of spectators, have also intrigued the world’s top athletes to come to Sigulda to compete. The German national luge team opened this season with a training session in the Bobsleigh and Luge Track as well as in the Sigulda Sports Centre, opened in May. This is the largest facility built in Sigulda during the past thirty years: it provides a world-level training environment for athletes, comprising a weightlifting hall, a running track and the best gear for functional trainings. Already at the time of laying the footstone of the building, Zintis Ekmanis, an Olympic athlete in bobsleigh, said that here athletes will be able to do their trainings in order to win the hundredths of a second that decide the victory. As previously reported, currently the name of Sigulda rings worldwide: Sweden, while considering its bid to host the Winter Olympics in 2026, has officially approached the Latvian Olympic Committee, exploring the possibility to use the Sigulda Bobsleigh and Luge Track for competitions in bobsleigh, skeleton and luge. Give someone LATVIA O-week for Christmas! Christmas is the time for giving. The organizers of the World Orienteering Championships suggest next year filled with pleasant emotions as your Christmas gift to your beloved ones: an invitation to the World Orienteering Championships spectator race "LATVIA O-week"! "LATVIA O-week"! will be held parallel to the World Orienteering Championships between 3 and 12 August. The runners will have an opportunity to enjoy sprint, forest sprint, and two middle and two long orienteering distances in the most picturesque areas of Latvia that, apart from inspiring people with the amazing nature, also narrate a story about the history of Latvia. When completing the registration for the competition, the entry can be designed in the form of a gift card with the recipient’s name on it. You can make one more surprise for the recipient of the gift: a shirt with the competition logo and design, to be collected at the competition arena. The World Orienteering Championships 2018 will be held in Latvia from 4 to 11 August. Sprint races will take place in Riga, whereas forest competitions will be held in the vicinity of Sigulda. The best orienteers from more than 50 national teams will take part in the Championships. The World Trail-O Championships will be held concurrently. It should be noted that WOC 2018 will be recorded in history as the last one according to the old format: starting 2019, there are going to be separate championships for urban orienteering and for forest orienteering. Today Opens the Registration for the World Orienteering Championships Spectator Race. Today, on the 1st of December, opens the registration for the World Orienteering Championships 2018 spectator race “LATVIA O-Week”. This is going to be a six-day long orienteering experience in beautiful and interesting terrains, as well as a unique opportunity to follow the performance of the world’s best orienteers and simultaneously test own skills in the terrains of the World Championships right here in Latvia. “LATVIA O-Week” will be held parallel to the World Orienteering Championships between 4th and 12th of August, 2018. On the 4th of August in the very Riga city centre anybody will have an opportunity to participate in orienteering sprint, but on the 7th of August the forest sprint will take place in The Etnographic Open-Air Museum of Latvia where orienteers will be rewarded with the intimacy of treasures created by the predecessors of Latvia. On the 8th of August in Sigulda and on the 10th of August in Kangari there will be a chance to test one’s orienteering skills in the middle distance, while on the 5th of August in Carnikava and on the 12th of August in Turaida - to challenge one’s stamina in the long distance. “The participants of “LATVIA O-week” will be the lucky ones to explore the best orienteering areas in Latvia.Every visitor will be able to find routes in Latvia that best suit his or her wishes and interests – be it nature, architecture, history, sports, adrenaline, cuisine or adventure.Therefore we invite you to visit the most popular tourist attractions that are located just a couple of kilometres away and are convenient to reach.2018 is the year of Latvia’s 100th anniversary. Special preparations for this occasion are on-going in Latvia, and WOC2018 will be among the centenary celebration events,” WOC2018 event director Jānis Lazdāns is looking forward to see you in Latvia. World Orienteering Championships 2018 will be held in Latvia from the 4th to 11th of August. Sprint races will take place in Riga, whereas forest competitions will be held in the vicinity of Sigulda. The best orienteers from more than 50 national teams will take part in the Championships. It should be noted that WOC 2018 will be recorded in history as the last one according to the old format: starting 2019, there are going to be separate championships for urban orienteering and for forest orienteering. A few weeks ago, three representatives of the IOF Office took their customary trip to visit the upcoming WOC organisers. This time, they made their way to Sigulda in Latvia, to meet the WOC 2018 organising team. The team from the IOF Office consisted of Sports Administrator David Wästlund, SG/CEO Tom Hollowell, WOC Senior Event Adviser Daniel Leibundgut and Office Administrator and Anti-Doping Officer Kirsty McIntyre. They visited the key persons from the organising team present, for example Jānis Lazdāns, Event Director, Inese Purgaile, Event Secretary , Girts Mamis, Finances, Aija Pakalna, Media, Daniels Karklins, Technical Director, and Karina Putnina, ceremonies, among others. In smaller groups they discussed everything from communication, media and ceremonies to arenas, embargoed areas and courses. In the afternoon, they visited different potential locations for the all important athlete party. “Since I started working at the IOF, we have visited the organisers of each upcoming WOC during the winter months. As a small federation, we tend to conduct a lot of meetings via phone or video call (in an attempt to save both money and the environment), but this is one of the meetings which we have found to be invaluable to hold face to face, as it is such an important part of building a good relationship with the organising team,” said Kirsty McIntyre. As the athletes head into winter training, we will be working hard to bring them the best WOC we possibly can. See you in Latvia next summer!